Infosecurity Magazine webinars are dedicated to bringing together the best in information security strategy, technology & insight. Each webinar includes high level industry speakers and analysts and provides relevant information and advice which our viewers can take away and implement in the workplace or to further personal development. For every session attended viewers can earn CPE credits towards CISSPs, SSCPs and ISACA accreditations. The threat of ransomware is very real. Studies have found that it has hit one in three companies. 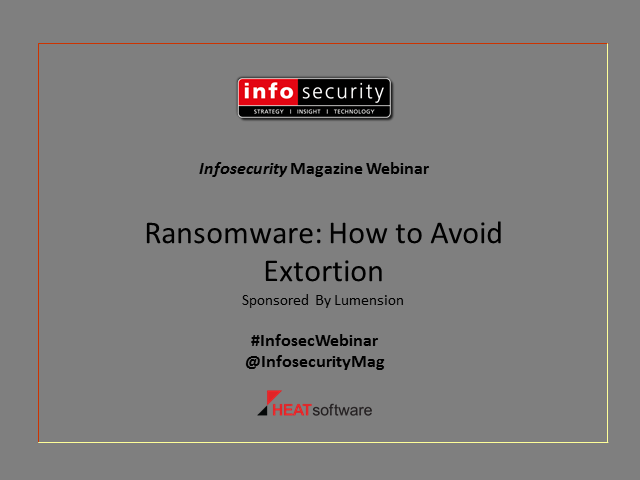 And crypto-ransomware like Cryptolocker and Cryptowall are the scourge of the web – and with new and ever-more sophisticated variants springing up rapidly this year, have become the tool of choice for online blackmail and extortion by cybercriminals. The threat of ransomware escalates as its quality improves and becomes ever more difficult to detect, potentially lying dormant on your systems, waiting to strike. Security teams, therefore, need to be awake to the threats of extortionate malware. • What varieties of ransomware are being used today? • What is crypto-ransomware and how does it work? • How does it get onto your systems, your network? • What can you do to protect your organization? All workplaces share the same security threat: the well-meaning but careless employee who may be more focused on productivity than protecting the company’s sensitive or confidential information. Often, without thinking of the potential consequences, they leave confidential documents in plain view, share passwords, circumvent security procedures and transfer sensitive data to the public cloud without company approval – ultimately costing much more to your organization’s bottom line than the employee hoped to save in time. IT professionals agree that more security incidents are caused by negligence than malicious acts. In this webinar, Dr Larry Ponemon of the Ponemon Institute and Michael Crouse, Director of Insider Threat Strategies, Raytheon | Websense, will discuss findings of the 2015 survey The Unintentional Insider Risk in the United States and German Organizations. Today's attackers employ a variety of deception tactics allowing them to impersonate legitimate users and bypass existing IT security defences. Web applications are often compromised in order to host malware or be turned into a phishing site. Users who visit these sites then become infected or have their credentials stolen, giving attackers access to your network. Once inside, attackers become insiders. They use stealthy techniques to move around the network, looking for targets, while remaining undetected for months. · Best practices for preventing, detecting and containing these threats. At the same time, more employees are using personally-owned devices to access, process and store corporate data. And the ease of deploying cloud applications has increased the incidence of employees using unauthorised applications to process corporate data. - and how to protect against web-borne threats. The job of the infosec professional is becoming ever-more complicated. The effectiveness of legacy methods, tools and attitudes is diminishing, while the sophistication of attackers is on the rise. The problem for security professionals is a complex one – they need to update systems and processes to suit the new threat landscape, while trying to keep up with the threat of specialized and well-resourced cybercrime. As the subject of information security works its way into the boardroom, the importance of creating a company-wide information security culture is increasingly understood. Staff engagement at every level is required in order for the culture to be truly present and effective. This session will look at what it takes to make each and every user part of the organization’s information security defense, and what training and approaches can be adopted to change the company’s culture. As organizations turn to the cloud to improve efficiency and reduce costs, information security professionals struggle to gain assurance that their organization’s data is secure. As sensitivity to privacy heightens following revelations about government surveillance, companies can’t afford to risk their critical information assets. The increased scrutiny has placed pressure on cloud providers to provide assurance around their ability to protect data. This session advises information security professionals about the questions they should be asking in order to find privacy and trust in the cloud. Organizations are increasingly finding themselves the target of cyber-attack, with each breach of network infrastructure increasing the likelihood that vital corporate data could be stolen. Developing a stance of readiness against attacks that seek to steal information is therefore essential. The range of security technologies available all claim to offer a solution to different problems – but which do you need to prioritize in order to give you a solid security foundation? How does the move the cloud affect companies’ data-loss prevention planning? Ensuring that cybersecurity is high up the company agenda is also crucial – as is a managed approach to patching and vulnerability scanning.